Today is the 20th anniversary of a BBC Radio 4 program(me) called In Our Time. I stumbled across it in its first year on my shortwave radio. That’s right, shortwave radio. In high school, I was very interested in radio broadcasting — its practice and science. I went to Radio Shack, bought a model radio kit, and built it. I think it picked up signals from the local airport, but it’s a little fuzzy now. My big next step was to save my babysitting money and buy the best shortwave radio $150 could buy (I wish I still had it). There was this thing that shortwave nerds did (may still be a thing) where you send away to a station that you pick up with a written request for a postcard. The farther away, the better. Different times of day were good for stations from different parts of the world. Stations liked to know where their listeners were, and listeners enjoyed collecting postcards from exotic locations. I particularly prized my postcards from Radio Finland and the Vatican (both had broadcasts in Latin). The BBC had frequencies that were strong throughout the day and night in central Texas. I enjoyed the programming on Radio 4 the best. It specialized in spoken content, including comedies, music, and cultural topics. In a household that wisely restricted TV viewing, it was my primary form of non-reading entertainment. I brought my shortwave radio with me to college and continued to use it to pick up the Beeb. When it arrived on the air in late 1998, In Our Time struck me as a standout even among Radio 4’s great content. I think what made it so compelling was its host, Melvyn Bragg. Mr Bragg invites 3 or 4 academics to discuss a set historical, scientific, or literary topic each week. He is not himself an expert on the topics (usually). He is something rarer in public life — a curious, well-educated layman. Mr Bragg never lets the professors get away with academic B.S. – he confidently, even doggedly, challenges his guests to explain the ideas or events under discussion without jargon or over-reliance on pet theories. He demands that they make their knowledge comprehensible to his audience. In this way, he doesn’t condescend to his listeners — he assumes that they, like him, are intelligent, informed, and curious — but not experts. In fact, I’d say he sort of turns the tables by holding academics, who are used to a certain deference, up to a kind of accountability. He demands that they engage in nothing less than educating the public. I dare say if you listened to all the episodes on various themes, from Roman history to Shakespeare to physics, you’d gain as good an overview of the subject as most 101 level university courses. Moreover, you’d learn that the stance of intelligent skepticism — of the spirit of energetic inquiry — is just as important to education as the facts themselves. For these reasons, I rejoice that In Our Time has been available as a podcast for years now, and that all of its magnificent back-catalog is available for free — no analog shortwave radios required. My opinion on the subject of online education has evolved over the past ten years. In part, it’s because the technology is catching up to the previously unique aspects of in-person education, and in part, it’s because I’ve benefitted both as a student and teacher using online tools. In 2010 and 2011, I ran a Latin and Greek tutoring business. I found that I could not keep up with demand and that travel time was eating into my profits. I think if I had kept at it a little longer, one way to manage this would have been to raise my rates. The other way to maximize my productivity would be to take the travel out of the equation. I worked with a great homeschooling family who lived a good distance from my home, so traveling to work with them was costing me about an hour a day. I took what I thought was a big risk at the time and asked if they would be willing to work with me via Skype. They agreed. It didn’t take me very long to realize that if I could find other like-minded teachers, we could actually start our own online school. I chickened out on that dream, and went back to teaching in a conventional school setting. I’m glad that by now, there are some really excellent online options for classical education. 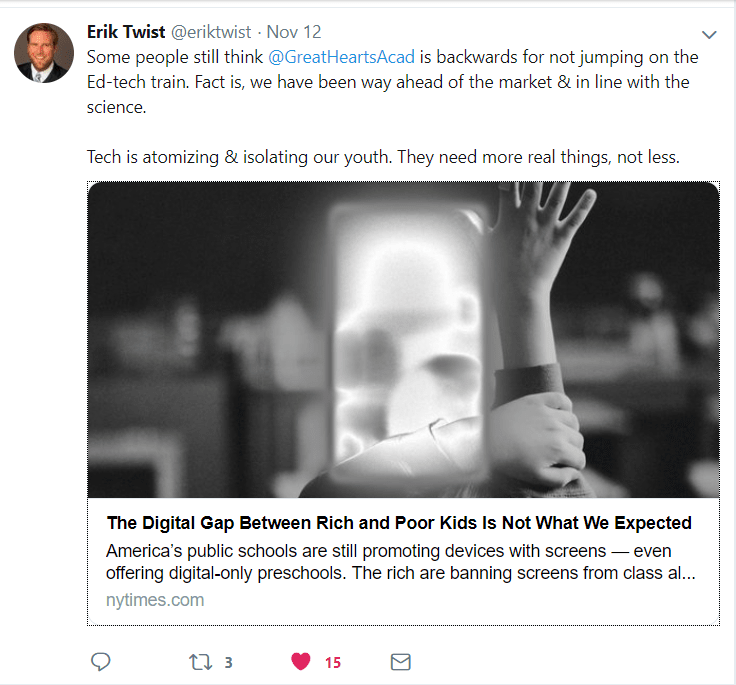 I hope that more teachers will begin to feel empowered to start their own schools, eliminating (or at least significantly reducing) the overhead by leveraging technology. Students will benefit from the increased innovation and customization that will be unleashed. In-person education will always have a place. But the increasing pressure on mediocre or poorly-differentiated schools and institutions of higher education will mean that we’ll see more close, merge, or evolve. The in-person education of the future will look a lot like the kind of settings that would have been familiar to previous generations – tutor-led small groups, specialized curriculum, and opportunities for students to engage in apprenticeships during the day. Teachers can and should be excited about these changes that are shifting the power away from administrators and that will allow them to become artists and entrepreneurs. Families will be able to better match their child’s education to their abilities and interests. So, yes, my opinions about online education have evolved. The problems with the status quo are so fundamental and pervasive that I don’t think they can truly be solved from within the system. I’m open to being proven wrong about that, too. If you care about increasing opportunities for students, I hope you’ll engage with others from a place of learning and humility. We owe that to the future.